It was told that two lovers committed suicide in this place. As time went by, the place where they were buried rose up and became a mountain. A foreigner visited this place and was accompanied by the natives. When the foreigner arrived at the top of the peak, in utter amazement of the view, he exclaimed, “the most one”. Mode of Transportation: Public Utility Vehicle (Bus, Jeep, Multicab)/Private Ride. *Can be hiked if you are from CMU, Musuan or Valencia City. Arrangement: Entrance Php 20.00 with free use of Comfort Room. No need for a guide. We always tend to go to far places to discover them but I also believe that discovering our own place can be very exciting and fun. So I intentionally write about an attraction in my hometown in order to share to other people that they can come visit here. If you are living around Musuan or Dologon or even in Valencia, one’s eyes can’t get off Musuan Peak for it can be seen from these vantage points. This mountain is actually one of the 22 active volcanoes in our country belonging to the Pacific Ring of Fire according to PHIVOLCS. It stands at 2, 119 ft (646 m) above sea level. There were reported eruptions in 1866 and 1867; and seismic activities in 1976 and 2011. I used to hike Musuan Peak when I was still small and even promised at that time that I will not go back to this peak again. You see, “love your own” never occurred to me at that time. But I never fully appreciated this peak until I grow up and engaged myself in hiking and tripping. I think I’ve climbed this peak for 20 times more or less. 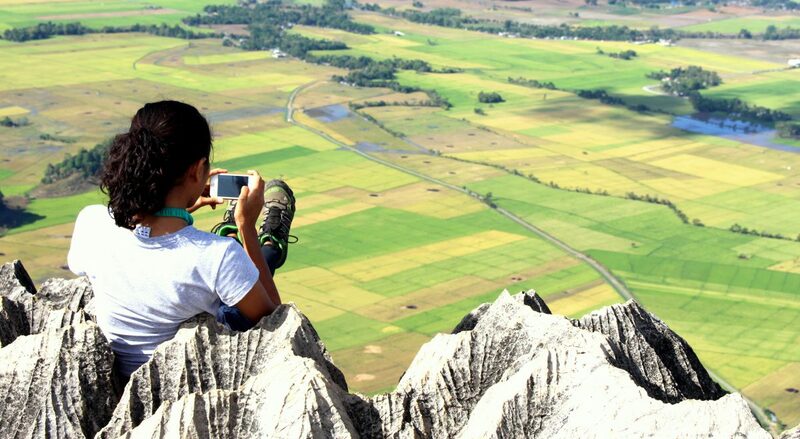 Bukidnon is home to 4 of the Philippines’ top 10 highest peaks– Mt. Dulang-dulang, Mt. Kitanglad, Mt. Kalatungan and Mt. Maagnaw. If you are not yet prepared to climb these peaks, or do not have enough time, most hikers/bloggers would recommend you to climb Mt. Palaopao and Mt. Capistrano. And I would like to add Mt. Kalayo (which means Fire Mountain) or Musuan Peak (Mount Musuan) in that list should you have shorter time or if you are just starting your hobby on hiking. A brief legend of Musuan Peak goes like this. It was told that two lovers committed suicide in this place. As time went by, the place where they were buried rose up and became a mountain. A foreigner visited this place and was accompanied by the natives. When the foreigner arrived at the top of the peak, in utter amazement of the view, he exclaimed, “the most one”. He found everything very beautiful from the top. The natives kept repeating what he said but because they couldn’t speak it the way that he did, they pronounced it instead as “mus-wan”. Later on, this became the name of the peak, thus Musuan Peak. As what they said, this is a legend. The start of the trail going to Musuan Peak. Upon entrance to the peak, you will pay your entrance fee and write the names of those who will go for hike. You can find on your left side, beside the entrance, a Zoological and Botanical Garden although this wasn’t really maintained through time. Be sure that you have your drinking water with you because there is scarcely a water source at the peak. You may also use the comfort room for your convenience before hiking. Be sure to bring a hat if you are hiking during midday or afternoon. Musuan peak is one of those very accessible peaks especially for impulsive hikes or nature trips. It can get very crowded during lenten season or holidays. But normally, you can enjoy the peak on your own on non-peak season. There are two ways to climb the peak. You can go by the main road (where you can also go biking). This is good for relaxed or leisure walks where there’s no time constraint. You may be able to reach the peak in 1 hour with rests. The second way is that you can trek at the short cuts though this can cause tachycardia (fast heartbeat) on your part. This is applicable if you want an intense hike or if you want to reach the peak in 3o minutes more or less. The shape of the mountain is likened to a conical shaped rice farmer’s hat. Upon going up the peak, you can start to see different wonderful views, the plains, rice fields, highways and the adjacent peaks. It’s nice to have a morning walk here where you can see the sunrise and experience the freshness of the air. Overlooking CMU and the rice fields. The hardly recognizable sea of clouds from afar. This is on the way to the peak after conquering the base part of the mountain. Sometimes, it can also get foggy here depending on what season you climbed. Nearing the peak, you can see pine trees along the way. There is also a short cut here. When you are almost on the top, you can see clearly the surrounding mountains, view of CMU, Valencia and the Sayre highway. The view when it is foggy. And finally, after how many minutes, you are able to say “Thank God” upon arrival at the peak at the same time wiping your sweat. You will be welcomed by the barking of the dogs here but they are tied. There are cottages where you can eat, sit and relax. And view decks too.They are located on the lower and uppermost part, so you can just choose wherever you want to hang out. You have all the time here to do whatever you like. Just be mindful of not leaving any trash behind. View deck and cottage on the uppermost part near the tower. This is also found on the lower park of the peak. It isn’t surprising to see vandalism here on the cottages though it is highly discouraged. Perhaps, people come here to vent out their feelings which may not be socially and environmentally acceptable all the time. I strongly discourage vandalism but reading through some of what the people write in here makes me laugh sometimes. It says, “Wala’y 4ever (forever)”. The person who wrote this don’t believe in the concept of forever such as that popularized by the Philippine soap opera Forevermore. The view of Musuan Peak from College Park, Musuan, Bukidnon. I don’t know about the others who went here, but for me, going up in this peak has always been therapeutic. The ambiance, cool breeze, surrounding views, being able to reflect, the comfort of being in your hometown– all these contribute to “the most one” concept. Granting the Musuan legend is true, the foreigner must have these things in mind (at least) when he said “most one”. This place has really been the most one. Truly, this peak, the view, is scenic, giving you a soothing relief from all cares. So when you are up in the peak, do not go down right away. Enjoy the peak, the view and live for the moment and listen to what God wants to impress on your heart of the spiritual lessons from nature. A view of Musuan Peak from Lumbo. There may be other places where we can say “most one” though Musuan has really gotten it’s title. But when I think of the concept of “most one”, I couldn’t help but attribute it to God- our most one (who can give us “most one” and Musuan), lover of our soul and the one with the greatest love able to sacrifice everything for us. When we talk of the place where we can say it is the most one, it is truly in the feet of Jesus where we can cast our burdens and cares. How wonderful it is to be able to reflect God’s love in my own Musuan Peak. It’s just reassuring. Sweet. And tranquilizing. So as we enjoy Musuan Peak, may we also enjoy God– the most one. View of Musuan Peak from Pacangan. Going down the peak will usually take 15-30 minutes. This means a lot of control on your part going down since it seems to be unstoppable sometimes. And finally, there is a feeling of accomplishment when you arrive at the entrance. For those who usually climb this peak, you may notice the new tire swing on the side. If you are not vegan, you can visit the Philippine Carabao Center and drink fresh milk and some of its products which is just nearby Musuan Peak entrance. Enjoy Musuan Peak! And don’t forget to come again.